If you haven’t heard, there’s a new restaurant in Glen Ellen, Aventine. With rustic Italian fare, this place is delightful. Into cocktails? Try their take on the Manhattan. It has a floral beginning and a smooth finish. Or try the salumi platter covered in artisan and house made salumis. The historic setting at the Grist Mill (which I wrote about here) isn’t bad either. In fact, I totally adore how the current restaurant embraces the old woodwork and has added additional touches that literally look authentic. For example, the italian pizza oven and the gorgeous metal chandelier add a nice layer of depth. All in all Aventine is a lovely addition to this gem of a town. It’s been awhile since my last post as I’ve been wrapped up in the 1960s which was an age before blogs. ha! Why 1960s? 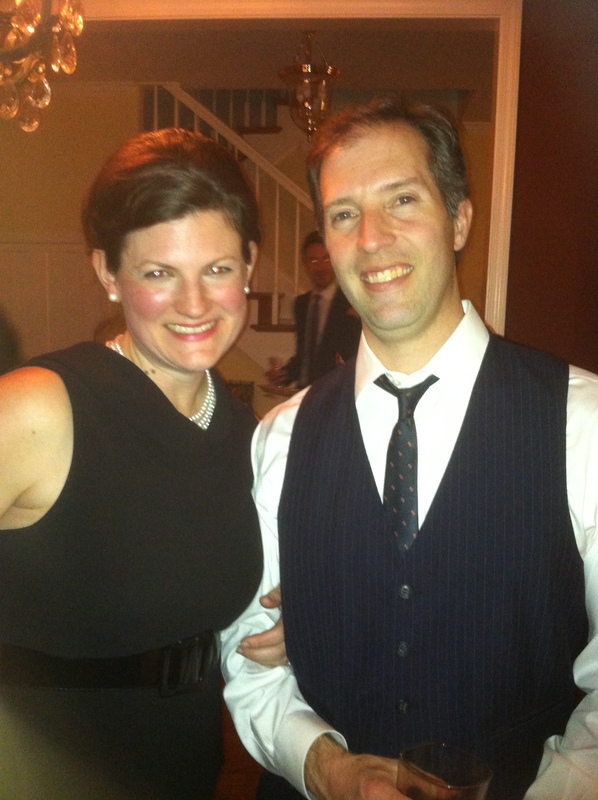 well my husband and my annual party was a Mad Men 1960s theme this year. From whiskey sours to cheeseballs, we went back in time. I even found vintage ads to decorate the walls. 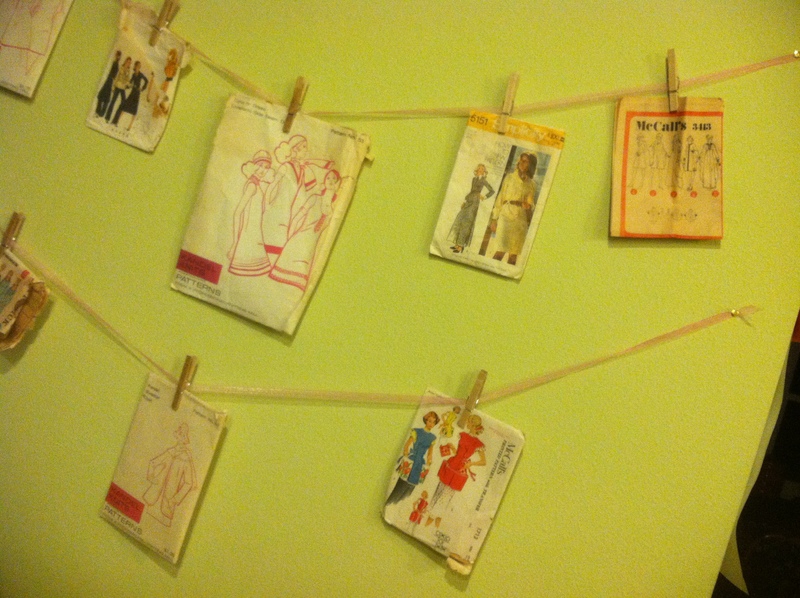 Vintage hose in the restroom and sewing patterns in the kitchen. 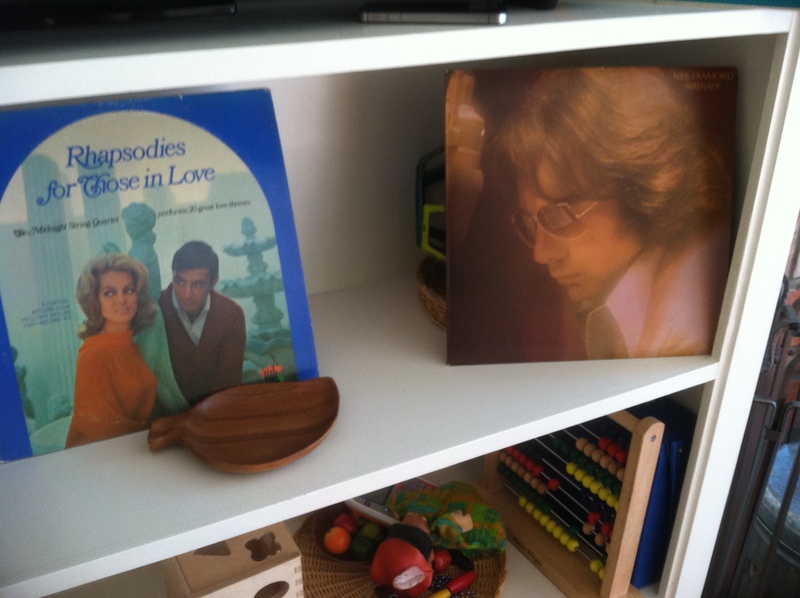 Just when I thought I had all the decorations ironed out, I stumbled across some vintage records. Check em out. The best part – was Bobby asking what’s that and the ensuing music lesson. Ahh life before streaming radio and pandora. but what really took the cake were the vintage canisters that my friend Rose Ann found. Check these babies out! 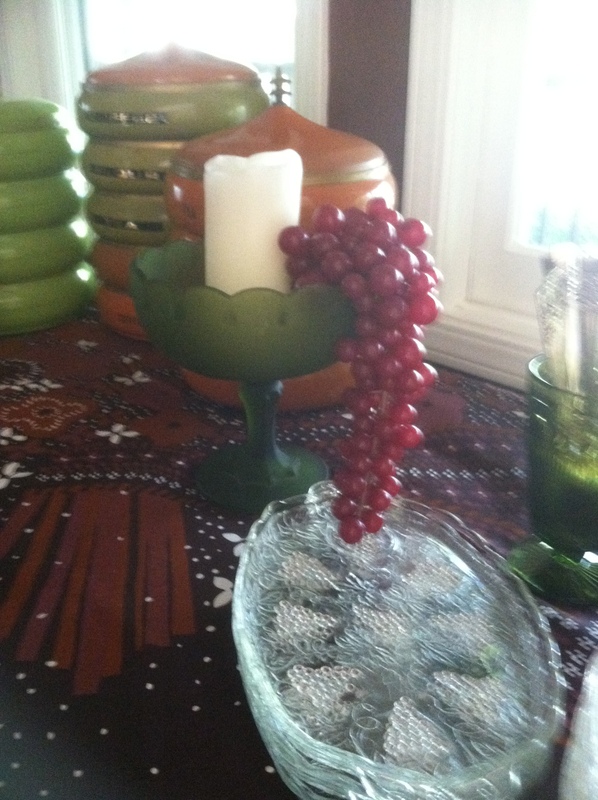 With an avocado green centerpiece and grapes (oh yes, they’re fake). We were rolling in 1960s style. So before it all started, Tony was checking up on some vintage tunes. We decided to start the night with 1960s french cafe music. Thank you Pandora. And then it was time for the bites to be displayed. Like I said earlier, my cheeseball made with roasted garlic, mushrooms and marsala went fabulously with the wasabi deviled eggs. Of course some trashy meatballs and smoked sausages with a very delicious surprising BBQ sauce. 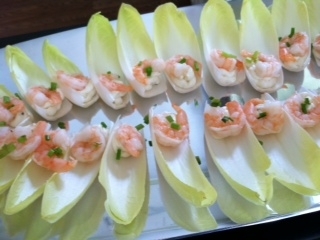 To top it off, my friend brought the quintessential shrimp cocktail to go with. Add to that all the other delicious delicacies and, bam! We were partying in style. I couldn’t have done it without friends and family pitching in to help out with vintage finds. So thanks to all. All the fun while raising awareness about a local foundation that is doing great things for kids and families dealing with epilepsy. Thank you Epilepsy Foundation of Northern California for all you do. And thank you all for reading. Wishing you happy or in 1960s lingo, boss, groovy, atomic times.
. What better way to spend a rainy day than making cookies? In my opinion, none. So, that’s how my boys and I spent part of our morning. Want to try them? The recipe is below. Before I jump into the recipe, what do you think about the plate in the photo? I stumbled across this beautiful find at a local thrift store in Sonoma. Although exceptionally beautiful, it had two small flaws. A couple of small chips, hence the price. So, i tried filling them with epoxy at least so they wouldn’t spread. I still need to figure out how to paint the chips. In any event, as a fan of all things vintage, especially old china I had to learn about this pattern. Would you know it was by the same folks who did flow blue? Furnivals a company dating back to the 18th century. Amazing they could make this in the days of horse and buggy transportation. The crazing on this piece is exceptional as is the painted pattern. This plate is now the oldest thing in my house. And, undoubtedly will remain chipped, but I love it anyway. 1 cup butter (my salute to Julia Child). If you don’t want to use all butter you can use shortening or try to increase the applesauce as a substitute. 12 ounces of dark chocolate. I use 72% dark chocolate from Trader Joes. Chop it up. Add eggs one at a time. Will look curdled, but don’t worry. Add pudding, vanilla, baking soda, cinnamon, applesauce, nutmeg, salt. Mix. Add oats. Mix. Then mix in flour. Shape cookies. An ice cream scooper is really helpful here. 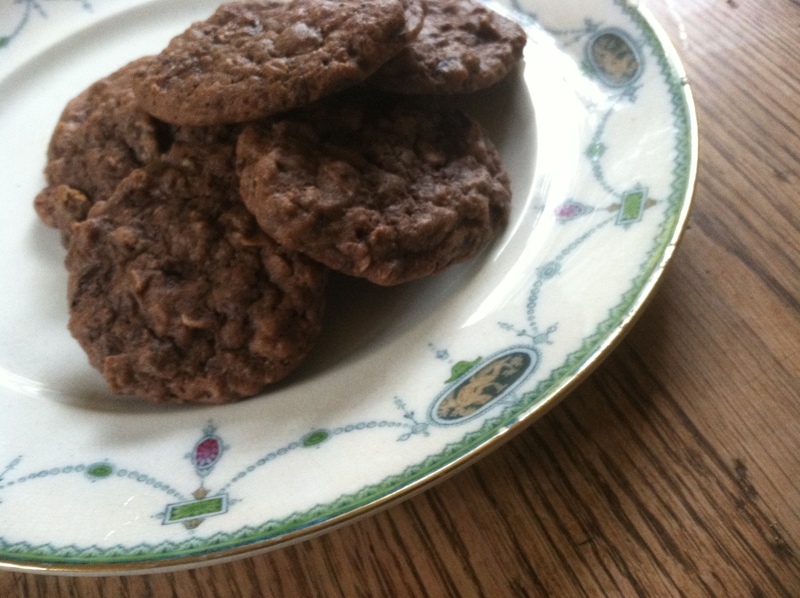 Bake until the cookies look dryish and soft. About 13 to 14 minutes. Let them cool on sheet for a minute or two. Then on a cooling rack. Display on your favorite plate. Enjoy with your favorite folks, and share with new friends. Happy baking! Living in the wine country has lots benefits, including being home to many wonderful taquerias. For nights when going out to eat isn’t an option, it is easy to fake it at home. This recipe including baking time takes about 30 -40 minutes. Rather than labor over making enchilada sauce and tortillas, which is always a fun activity especially with kiddos, I buy my enchilada sauce and tortillas at my favorite taqueria. I buy enough sauce so I can use half and freeze the other for a a rainy day. Then, add a few other premade items and you’re on your way. Preheat oven to 350. Mix together chopped chicken, 1.5 cups of cheese, the chopped greens, 1 cup of enchilada sauce and 1 cup of red pepper & tomato soup. Take a baking dish, 13 x 9 works well. Coat the bottom with a little bit of the soup. Fill your tortillas with the mixture, about 1/2 cup worth. Then roll and place in the baking dish. Do the same with the rest of the tortillas. 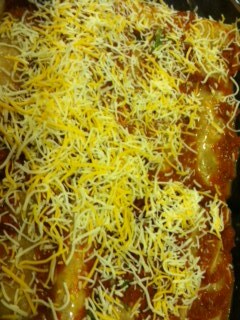 Once all of them are in the dish, then top them with the rest of the sauce (enchilada sauce + soup) and cheese. Bake until warm (about 20 minutes). Serve with hot sauce. Enjoy! Fall is one of the most amazing times of year out here in the wine country. The vines turn colors that rival the most beautiful sunsets. It is surely a special season providing much to celebrate. It also gives the perfect reason to teach two little boys about the season. 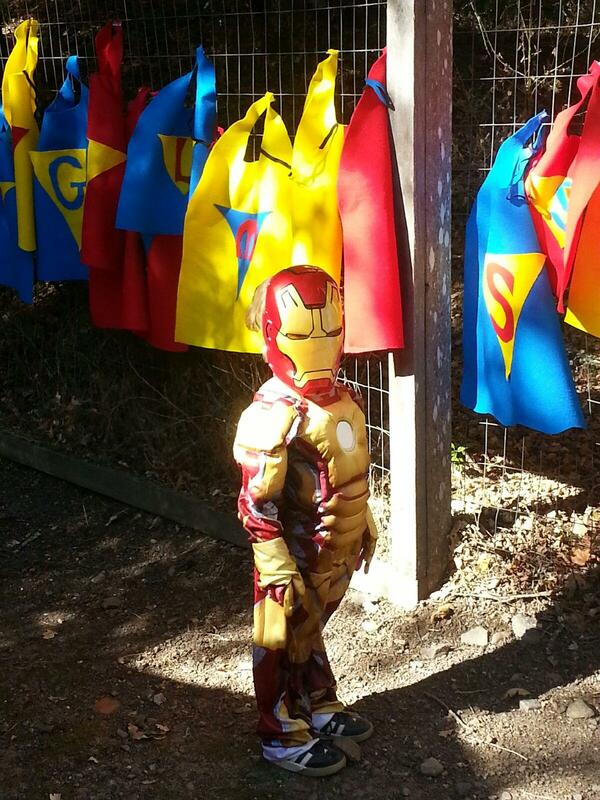 Yesterday, my 4 year old was looking up at the trees in the backyard. He was looking in wonder watching the leaves dance to the ground. Red, yellow, orange and brown – our backyard is such a gorgeous palate. So, there’s no better time to bring the colors inside. At least that’s what we’ve done. I had my boys collect their favorite leaves and then arrange them on our dining room table. Watching them do it was the most insightful experience. 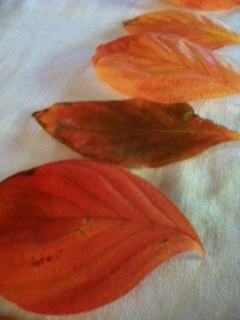 My older son decided to sort the leaves into colors prior to placing them on the white cotton tablecloth. He then arranged them by size and placed them neatly in a straight line all the way around. My nearly 2 year old son, piled them in a heap. Developmentally I’m not sure what the relevance is of their two different organizing strategies. But I think that the end result is a masterpiece representing both of their visions of how the leaves should be. In my world, it’s perfection to say the least. At the end of the day though, the leaves are just a reminder of how gorgeous the world is around us. By pointing it out to my boys, as they get older, hopefully they’ll take time to smell the roses or watch the leaves dance to the ground. Have you done it lately? I urge you to try it. 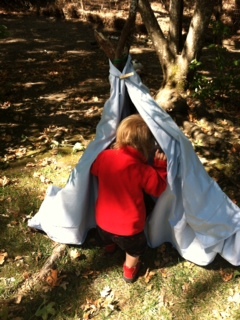 For more thoughts, kids arts projects and ideas on fall, and recipes check out my other blog at modernmamamary.com. Today was one of those days when after a morning adventure down at the Sonoma County Regional Park, the boys just wanted to explore the backyard. They found some pretty long sticks. In an attempt to keep them from sword fighting, I asked the boys if they wanted to build something. I already knew that the boys would want to do this as both of them love building anything. Inspired by a friend who just built a teepee for a party they’re throwing, I thought about recreating a mini version for the boys. The entire process was fun and a reminder of why life out here in the country is so fabulous. After finding the long sticks, the boys helped hold up the sticks while I tied them together with green rope. Wrap it up in an old sheet secured with clothespins, and voila – a cozy spot where a child can chill, giggle and make believe. As soon as it was done, the boys crawled in and spent time laughing. I’ll never know what exactly they were laughing about (nor does it matter). One thing is for sure though I will always be tickled pink by the memory of creating a space where they were so happy to be themselves. I recently scored a double eagle! In golf, a double eagle is an extremely rare score of scoring three strokes under par on one hole. This double eagle was not in the golf sense of the term, but in the literal sense of a beautiful bottle of wine sealed in wax and decorated with leather. You may wonder about the story behind this unique acquisition. So, here goes, the other evening my husband and i were able to leave the kids with their grandparents and enjoy a piece of our wine country home. It’s not the usual occurrence by any means, but a welcome change of pace. We decided to act like tourists and pop into a local tasting venue. This particular place, Sonoma Enoteca, showcases local small production wineries. As luck would have it one of the winemakers, Vance Rose, was pouring a few of his labors of love. So, we were able to learn a little about his vineyard which lays atop a breathtaking road and literally straddles Napa and Sonoma Counties. Ironically, my Italian husband cycles past this divine spot on his Italian bike on a weekly basis. I digress. As wine tastings usually go we started by tasting a very light and crisp white wine. A lover of complex flavorful bold reds like Petite Syrah or Zinfandel, I was quite looking forward to trying something meatier. So, I tried a local zin, which was satisfactory, but then something magical happened. The winemaker poured a taste from a very different bottle. Adorned with a leather label and sealed in wax, this wine had all the fixings of being something special. 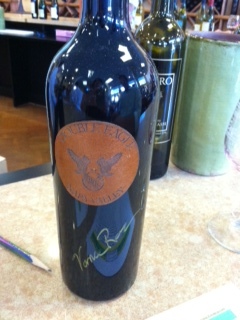 The Double Eagle was a red blend with Cabernet Franc, Merlot and Cabernet Sauvignon. It was rich, deep, yet smooth and fruity. Sipping it was a beautiful moment. If that wasn’t enough, the winemaker had stumbled across a bottle from the prior vintage, 2009. As he dusted it off, it seemed like fate. That bottle now sits awaiting a special occasion, a double eagle. Who knows when that double eagle worthy of opening this bottle will occur. In the golf sense it could be awhile if I’m playing that is. My husband, well, that’s a different story. But I’m looking forward to life’s double eagle which in my book will be three occurrences worthy of celebration. Or maybe the wine itself will be the occasion. I’ll let you know. Entertaining in the wine country means being flexible. Whether it’s a small group of friends, large chaotic kids party, or small intimate formal dinner, it’s all about combining fabulous friends and flavors. Of course throwing parties with kids is an entirely different animal as the entertainment options can range from as simple as coloring sheets and play dough to extravagant hired entertainers and traveling petting zoos. Recently while enjoying a quiet laid back casual dinner of homemade pizzas and local wine, the conversation turned to our favorite TV show, Downton Abbey. 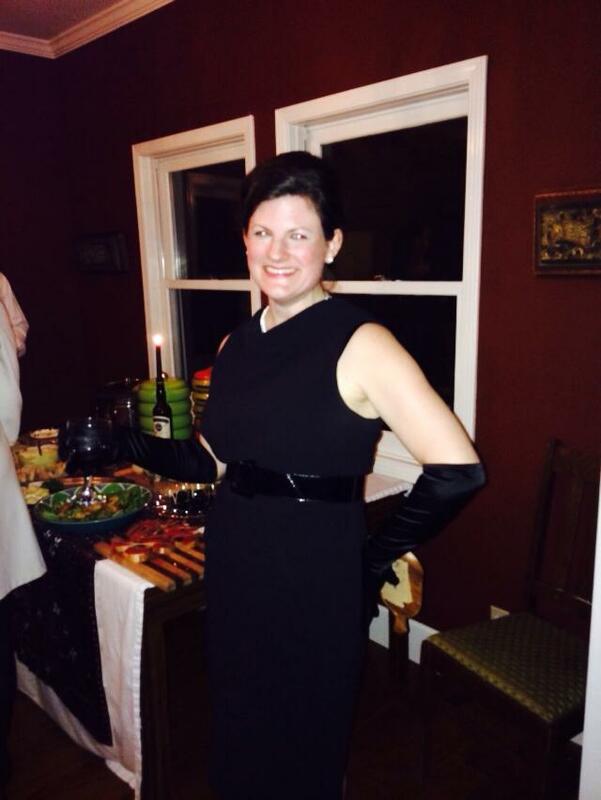 The four of us decided to throw a small intimate black tie dinner party for fellow Downton fans. We decided to do something revolutionary: have a party without kids. Us parents don’t get out much, so the thought of adult time made it more fun. The beginning planning stages involved conversations about whether it would be white or black tie, when to send invitations and what to serve. From the invite to the place settings, every detail was thoughtfully planned. I used Paperless Post for the invitations. I chose a formal design with a picture of a chandelier similar to the one that would decorate the party. So, for the menu, I had a 24 pound turkey that I built the menu around. As far as set-up, Emily Post was helpful in setting the scene. The detailed diagrams helped guide the European table setting required for a formal Downton evening. Admittedly though, I didn’t follow it exactly as to make things easier I put the dessert utensils on the table. (Gasp!) 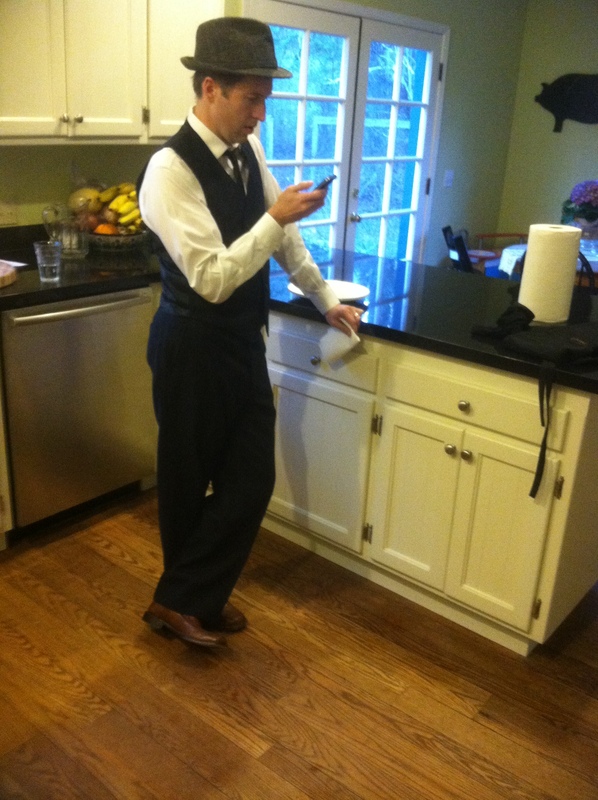 A sin for which I likely would have been fired or put on probation had I been working at Downton Abbey. With most of the food ready to go, greeting guests was a pleasure! We enjoyed the flavors and libations. 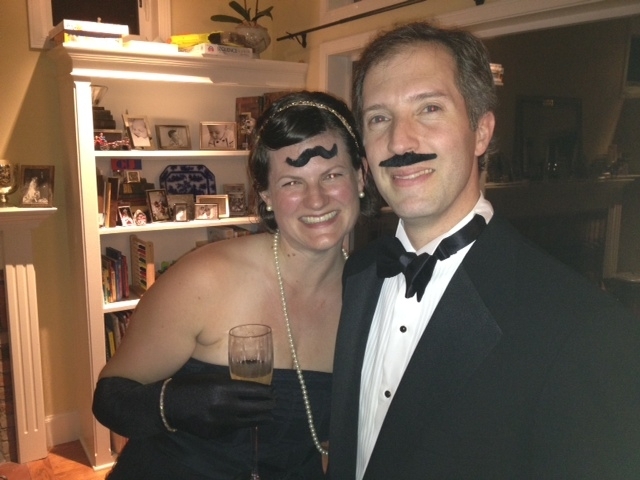 And, afterwards silly fun with fake mustaches (really worth a laugh). In Downton Style the men departed for cigars & scotch and a chat about all things manly. Us ladies did the same (cigars, scotch and a chat about all things girly). Of course ages after our bedtime, we dimmed the lights and started dancing the night away. Like I said earlier, us parents don’t get out much so we are easy to entertain. Now it’s on to planning our next one. 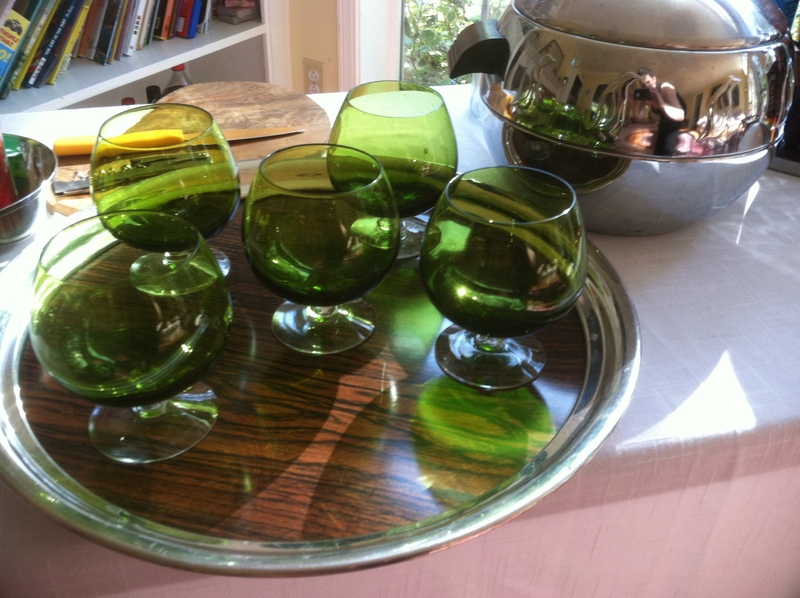 Perhaps it will be Mad Men cocktail party or a Gone with the Wind garden party.. Any ideas? ?